The use of glass in the home and office environment has increased hugely in the last few years and for good reason  it’s such a versatile material. Glass became popular in decorative design in the Art Nouveau movement of the late 1800s but with modern treatments such as laminating, toughening and coating, it’s now a much more practical, adaptable and affordable option for the home. Used previously for functional reasons and quite sparingly, it’s become an important and versatile tool for architects and interior designers, as it’s both aesthetically pleasing and practical. As a result, it can be used in any number of innovative ways. Equally suited to cladding walls or as partitions and balustrades, for fittings and work surfaces within both commercial and domestic environments, its most obvious application in the home is as a shower screen in the bathroom or as a splashback in the kitchen. The attraction of glass as a material lies mainly in its ability to promote light and space  it can make a room feel bigger, which is something from which most homes would benefit. Whilst traditional tiles can look rather dated and suffer from scruffy grouting, glass is a modern, clean and easy-to-maintain alternative. Its versatility lies in the almost limitless number of possibilities it offers in terms of design. 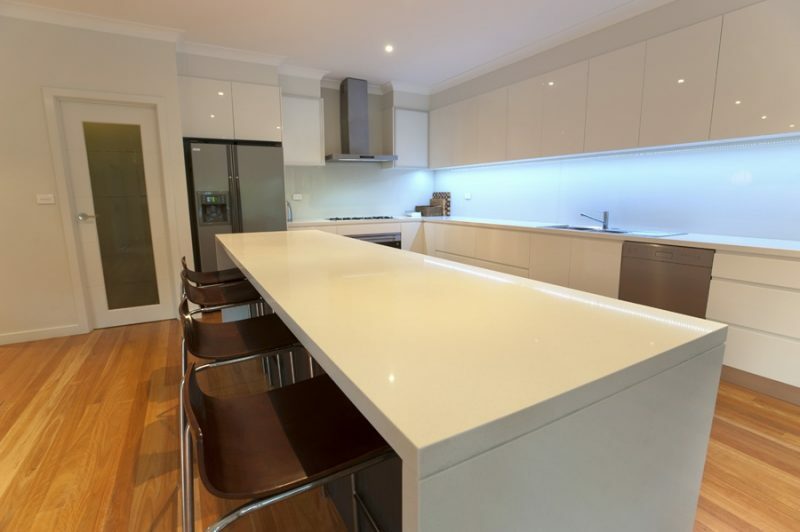 Highly reflective, a glass splashback will allow you the option to add impact with a vibrant burst of colour or to blend a more neutral base colour for a classic look. We offer splashbacks in an almost inexhaustible number of colours, including the full RAL spectrum, the Dulux and Farrow and Ball ranges. So if you have a favourite painting, a vase or some other favourite item youd like to feature elsewhere in your room, consider picking that colour up in your splashback. Its a great opportunity to exploit your creative flair. And the potential doesnt stop there. Consider using your own choice of image in your design perhaps a foodie picture behind your hob, or a vintage print, or faux wallpaper or bricks  to give a retro feel. Even one of your own photographs to give a truly personal look. We can also create shapes and add LED lighting systems, to give your new splashbacks even more dramatic effect. Colours Our splashbacks are made from a high grade, low iron glass, which produces a truer representation of your chosen colour as it eliminates the green hue youll see in other types of glass. We use a high spec, premium glass paint. However, if you opt for the cleaner streamlined look of a plain colour, we recommend choosing a complementary shade rather than matching an existing colour within the room as colours will look shinier through a glass splashback so will not look exactly the same as your paint. If youre looking to use glass in a large area, you should know that we can offer you extra wide panels which will minimise the number of joins and thus give you a seamless finish. The most commonly used glass thickness for kitchen splashbacks is 6mm though we do have other thicknesses if required. If you have a fairly straightforward area in mind for your splashback, you may want to consider measuring up yourself and providing us with a template from which we can create your bespoke glass. It’s a fairly simple process which we can help you with and of course, we supply all the necessary adhesives and easy-to-follow instructions. However, if you have a more complicated area with cut-outs, downlighters and wall sockets, we offer a comprehensive measure, supply and fit service, which our expert team carry out quickly, efficiently and at a time to suit you. This can all be accomplished within a 2-3 week period, so if you have a deadline, do pick up the phone to talk to us soon. We hope we’ve answered any questions you might have but please dont hesitate to get in touch if youd like to know more or fancy a look round our showroom. Were always keen to show it off and the kettles always on.